Lead Water Main? Know your Options | Ken Neyer Plumbing, Inc.
How do I know I have a lead water line? If your home was built before 1986, it probably has some lead piping in it, and perhaps in the water main. There are a few ways to check on this. The City of Cincinnati has a website of maps where you can check on the presence of lead water mains. You can also do this test: Go to your water meter and determine which side is the incoming side of the water main. Expose the metal of this pipe (if it has wrapping on it) and then scratch the surface using a penny. If you still see a dull gray coloring, it means you have a galvanized steel water main. This isn’t an ideal metal and will eventually need replacement, but it doesn’t post any lead hazards. If you see a copper color, you have a copper water main. If you see a shiny metal color—you have a lead water main. You can also schedule water testing for your house to find if there is lead in the water supply. 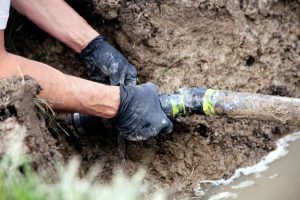 What do I do if I have a lead water main? There are ways to reduce your exposure to lead: only using cold water for cooking and drinking (boiling water does not remove lead), regularly flushing out the pipes before using them, and changing aerators in faucets. But these steps have only a minor effect. The best options to reduce your family’s exposure to lead is to install a whole-house water filtration system that is certified for lead removal or to have the old lead water main replaced with copper. We handle both services, and you can get in contact with us to find out the best method to ensure your family’s health is protected. We strongly recommend replacing the water line if you can. The portion of the water main that runs under your property is your responsibility, not the public utility company’s. You will have to arrange for replacing the line with our plumbers. However, we can make this process fast and unobtrusive—we use trenchless technology to replace underground pipes without needing to tear up your yard for a few days. You can trust all your needs for plumbing in Covington, KY. If you have any questions about possible lead exposure in your home, please give us a call. Ken Neyer Plumbing, Inc. has served Greater Cincinnati and the surrounding Tri State area Since 1972. Schedule water main service today.